Newly crowned national time trial champion Georgia Williams added the New Zealand Road Race title to her collection today, becoming a dual national champion after a phenomenal solo victory in Napier. Not wanting to take any risks with a sprint finish, the 24-year-old attacked and led solo into the final 40 kilometres of the event and managed to increase her advantage over the reduced peloton by almost one minute each lap. Her dominating performance saw her finally finish five minutes ahead of the sprint for second place. Two-riders, Ione Johnson and Kerry-Anna Page, animated first part of the 114km event, breaking away on the opening country lap and extending out to a four-minute advantage. However, as the duo were slowly reeled back towards the peloton as they entered the city circuits, Williams picked her moment, using the leaders as bait, and launched across and straight past the leaders as she barreled towards victory. After taking confidence from claiming her first ever elite national title yesterday, Williams started the road race with a lot of determination to try and do ‘the double’ after previously finishing runner-up on three separate occasions. The Mitchelton-SCOTT rider clearly had the legs and was able to take a well deserved road race victory. Georgia Williams: “It’s awesome to win this title today and it is going to be really great to take the New Zealand jersey back to Europe. I don’t think anybody was expecting me to go so early so I think I caught people off guard, but I didn’t expect to put so much time into the peloton." “I just put my head down and tried to keep going. I could feel the time trial effort in my legs a little bit but I was telling myself it was a good activation for today. Elia Viviani will make his debut for the squad at the 20th edition of the Australian race. 2018 marks the anniversary of two decades since the creation of the Tour Down Under, first World Tour event of the calendar and at the same time the most important race held in the Southern hemisphere. For that reason, the race – whose start is scheduled two days after the traditional People’s Choice Classic criterium (January 14th) – will kick off from Port Adelaide, just as it did twenty years ago, before taking the peloton through more than 80 towns (including Stirling and the 3km-long Willunga Hill, with their spectacular stage finishes, but also Uraidla, a new-entry in the race) and returning to Adelaide for the final stage, which will see the sprinters move again into the spotlight. Elia Viviani – one of Quick-Step Floors’ seven new signings for the 2018 season – will be at the start of the Tour Down Under (16-21 January), which he previously raced in 2011 and 2014, and is looking with optimism to the six-day event. “I like the Tour Down Under, it’s one of the best races to start the season – with nice stages, spectacular landscapes and fantastic fans, who always create an electric atmosphere – and I’m motivated to kick off the season on the right foot. It’s a star-studded field at the start and I know it won’t be easy in the sprints, but I have a strong team with a good lead-out and this gives me confidence for my debut in the Quick-Step Floors kit, which I’m eager to show in Australia”, said the 28-year-old Italian, winner of 50 races in his career. Fellow countrymen Eros Capecchi and Fabio Sabatini will join the 2016 Olympic Omnium Champion, who’ll also rely on Dries Devenyns, Enric Mas (who last year made his pro debut at the Tour Down Under), and two other newcomers, Michael Mørkøv and Florian Sénéchal, in his first outing for Quick-Step Floors. 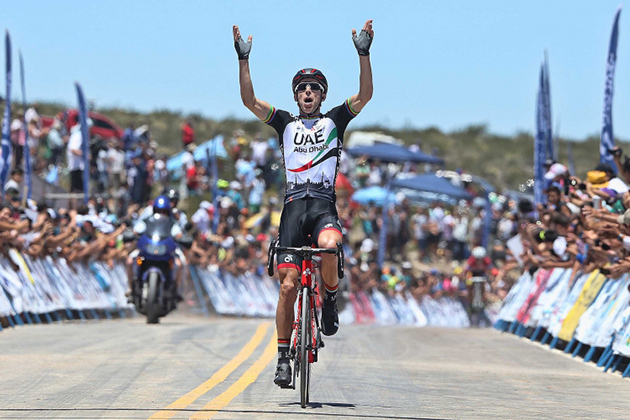 UAE Team Emirates will kick off their second season in Australia, participating in the Santos Tour Down Under, a World Tour circuit race scheduled from January 16th to the 21st. A criterium race called the People’s Choice Classic (50.6 km on January 14th) will serve as an interesting appetizer for sprinters before the Tour Down Under, which will take place over 6 stages: 4 fractions will be suited to the speed wheelers, while the 4th stage (Norwood-Uraidla, 128 km) and stage 5 (McLaren Vale-Willunga Hill, 151.5 km) will feature uphill arrivals that will most likely determine the outline of the general classification. Rui Costa: “For the first time in my career I’ll be participating in the Tour Down Under. I want to get to know this race, but I’m well aware that I will end up next to riders who are already in great shape, especially the Australians. EUGENE, Ore. (BRAIN) — The word you hear most often when you ask Oregon retailers about the state's new bike tax is "hope." But not "hope" in a very ... hopeful way. Hope in a somewhat dubious way, like when you say, "I hope it doesn't rain on our ride" as you are stuffing a shell into your jersey pocket. Retailers hope that proceeds from the $15 per bike tax — which they began collecting this week — will be used to improve bike infrastructure as required by the law that created it. Even though almost all retailers BRAIN spoke with this week said they opposed the tax as unfair and misguided, most said if it leads to better bike riding conditions they will feel better about collecting it. The tax applies to sales of new bikes with 26-inch or larger wheels and a retail price of $200 or more, and is expected to raise about $1.2 million in its first year. Oregon has no regular sales tax, so many bike retailers are unaccustomed to collecting one. "I hope it will get used to spruce up the bike paths," said Al Snell, owner of Oregon City Classic Bikes. When BRAIN spoke with Snell on Wednesday, he had yet to make a bike sale this month, so he wasn't sure how consumers will react. He said he opposed the tax when he heard about it last year and he contacted his state representative to complain. "Here we are, trying to promote the safest, greenest, easiest way to get around, and you are going to tax us for it?" he asked. Retailers BRAIN spoke with this week have been more concerned about the fairness of the law, rather than the actual burden or potential effect on sales. But the burden is not inconsequential. At Bicycle Way of Life in Eugene, managing partner Matt Ritzow estimated that each bike sale in the first two working days of 2018 included an extra 5 minutes of chatter about the new tax. "About half (of the bike buyers) asked if we would just cover it," he said. He's had to explain that the store can't afford to cover the cost, especially on lower priced bikes. "We've tried to explain that on an average $600 bike sale, by the time we pay rent and salaries and other costs, we make maybe 10 percent. So we end up with $60 and they want us to give away $15 of that. Most people get it once I explain that," Ritzow said. While the store isn't going to eat the bike tax cost, Ritzow is running an ad in the local weekly paper with a $15 coupon that can be applied to taxable bikes bought this month. "Maybe that will bring some people in," he said. Ritzow said his POS system requires cashiers to add the tax as an additional line item, a process that would be easy for staff to forget. So he's covered the cash register with sticky notes reminding cashiers of the tax. He's also planning to make a laminated sign to put on the counter to remind customers of the tax.